This site is about Middari, but I will introduce you to the women behind the screen you will come to understand how I came into the game and why I can't leave! Please enjoy and welcome to the world of Ever Quest! My real name is Julie. I am 22 years old. I live in New York City graduated from NYU's film and television program I majored in Creative Writing. I was born and raised in a small town in Pennsylvania, I am the second and last child for Harvey and Janice (my mother and father) I have an older brother named Chris and he and I were both born on July 22nd only he was 79' I was 83' (extactly 4 years apart). My family is the most important thing in my life bar none, when I was 8 my mother and father got a divorce and since then it has been my mother and me, she is my best friend and she taught me a lot and how to respect myself and others. She plays Ever Quest also she is on The Tribunal and her name is Soyna, shout out to you mom!! :) My brother is overprotective but he is allowed to be he is my brother, he also plays Ever Quest on The Tribunal server and his name is Xomega, shout out to you bro!! :) I want to offer my congradulations to my brother and his girlfriend Joanne, they are to be married on August 6th 2006!! Woot! 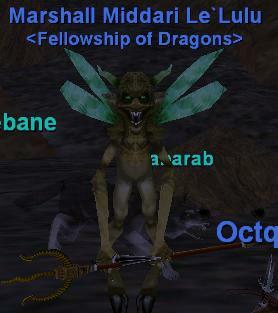 I began playing EQ not long after September 11th 2001, I lost a few friends that horrible day and I needed a way to express my anger and pain on things so my brother told me about EQ and said "You fight stuff and it is a roleplaying game and you'll love it." I love the game it is fun killing fake things lol! Middari is the oldest of 6 children her sister Bianu and brother Kiddari are twins, Meaolan, Menluan and Canoodle are Middari's triplet brothers. Middari has been married twice first to a Wood Elf Ranger they have one child named Aiddari, young Barbarian Beserker. Her second husband was a Dark Elf Cleric they have two adopted children, Kolbanu a Barbarian Shaman and Aorlgona a Human Warrior. She also adopted one more child as a single women, Mulberrie a Wood Elf Ranger. Middari is now single. A Leauge of Their Own, A Few Good Men, Sleepless in Seattle, The Flintstones, Dirty Dancing, Tommy Boy, Evita, Lord of the Rings: Fellowship of the Ring, Lord of the Ring: The Two Towers,Lord of the Rings: The Return of the King, Harry Potter: and the Sorcerer's Stone. Harry Potter: and the Chamber of Secets, Harry Potter: And the Prisoner of Azkaban, Die Hard 1, 2 and 3 (Bruce Willis is hot), Star Wars Episode's: 1,2,3,4,5 and 6, Batman, Batman Returns, Batman Begins, Mary Poppins, Sound of Music, Star!, The Americanization of Emily, Victor/Victoria, The Princess Diaries 1 and 2, Shrek 1 and 2, Coach Carter and many others! Backstreet Boys, Justin Timberlake, Ricky Martin, Madonna, Nickleback, Maroon 5, The White Stripes, Trapt, Smashmouth, Nelly, Eminem, 2 Pac, Janet Jackson, Micheal Jackson, Missy Elliot, PinK, 311, Linkin Park, U2, Black Eyed Peas, Coldplay, Green Day, Hoobastank, The Killers, Velvet Revolver, Zeromancer, Franz Ferdinand and many many others!